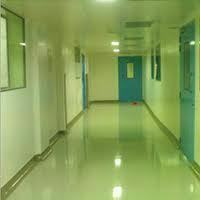 Neotuffcoat WB is a two component, water based, VOC compliant epoxy-coating. It acts as a tough abrasion resistant coating that withstands wear and tear and can be applied on floors as well as walls & ceilings. Neotuffcoat WB is a cost-effective environment-friendly solution for a variety of applications involving protection of concrete from weathering and/or chemical attack. Neotuffcoat WB is available in a few colours. Water based, odour-less and VOC compliant. Provides good wear & tear.